Mumbai Indians posted a challenging 187 for five against Rajasthan Royals. Quinton De Kock smashed 81 off 52 balls. 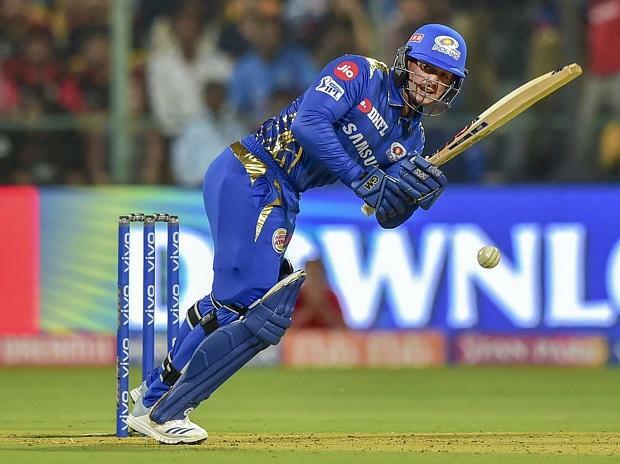 In Match 27 of VIVO Indian Premier League (IPL 2019), englishman Jos Buttler laid the platform with a rampaging 89 while Shreyas Gopal held his nerve at the death to power Rajasthan Royals (RR) to a four-wicket victory over Mumbai Indians (MI) at the Wankhede Stadium on Saturday. This was Royals' second victory of the season in seven games after losing a last ball thriller to CSK less than 48 hours back. Put into bat, Mumbai Indians rode on a aggressive 81 by South African Quinton De Kock to post an imposing 187/5, but Buttler's 43-ball knock studded with eight fours and seven sixes set the tone before Royals survived a scare to finish the game in 19.3 overs.